According to a new report North America IoT Security Market, published by KBV Research, the North America IoT Security market is expected to attain a market size of $12.0 billion by 2022, growing at a CAGR of 22.6% during the forecast period. While the effort to tackle security issues regarding IoT devices are in the rise, as providing a secure environment is of utmost importance for the users of the technology. It is vital to have secure gateways that connect IoT devices to company and manufacturer networks. Compared to devices controlled by humans, the IoT devices are online all the times, and are a perfect platform for infiltration. Therefore, more security needs to be implemented on these gateways to improve the overall security of the system. The challenge however is with the concept that is relatively new. In 2015, Building and Home Automation segment dominated the North America IOT Security Market by Application with a market share of around 17%, in 2015. However, Telematics segment would witness highest CAGR of 28.1% during the forecast period (2016-2022). In 2015, Network security dominated the North America IOT Security market by Type with a market share of around 32% in 2015. Cloud Security however, would witness highest CAGR of 29.3% during the forecast period (2016-2022). Based on the verticals, BFSI segment dominated the North America IOT Security market by vertical, with market share of around 19%, in 2015. In 2015, Identity & Access Management segment dominated the North America IOT Security market by solution type. The segment has generated revenue of USD 542.1 million in 2015, growing at a CAGR of 18.9% during the forecast period. However, Distributed Denial of Service Protection segment would witness maximum CAGR of 28.6% during the forecast period (2016-2022). 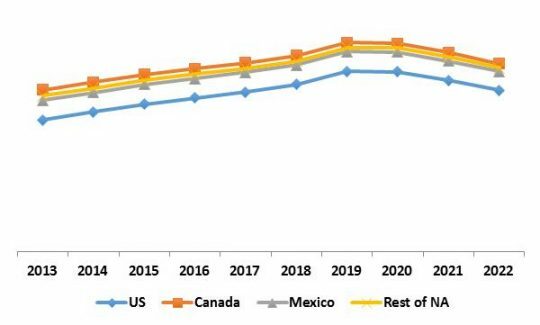 North America IoT Security Market Revenue Trend by Country, 2013-2022. In North America, U.S continues its dominance in this market with a market size of $2.2 billion, in 2015. However, Canada exhibits maximum CAGR during the forecast period (2016-2022). The report has exhaustive quantitative insights providing a clear picture of the market potential in various segments across the countries in North American region. The key influencing factors of the North America IoT Security market have been discussed in the report along with the elaborated company profiles namely IBM Corporation, Symantec Corporation, HP Enterprise Company, FireEye, Inc., Intel Corporation, Cisco Systems, Inc., Check Point Software Technologies and Infineon Technologies AG.